Jessica is in love, with a daemon from hell! Ezkiel Sykes wants to cross the realms and be on the Earth, with Jessica. Lenny, Jessica’s friend & wanna-be lover, maybe the key to make it all happen. But is it all that simple? Is it really possible? And what happens afterwards? Does Ezkiel really love Jessica or has another motive? 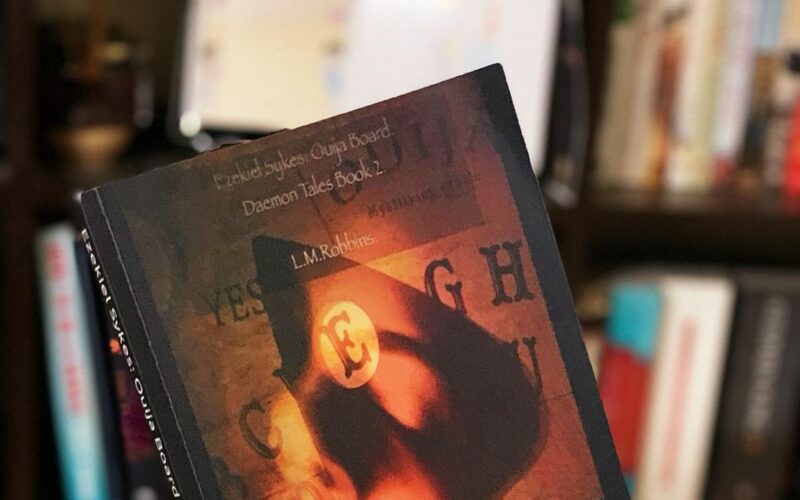 Ouija Board by L.M. Robbins is the first book I worked on in this new year. The author contacted me with a very unapologetic description of his book – it’s an erotica romance novel, language is curt and quite graphic. After my own due diligence, reading the first few chapters, I finally accepted the book for review. The book, Ouija Board, is mainly available in an ebook format. It’s currently available for free on Kindle Unlimited and is available for a reasonable price, even in India. The book has been originally published in Great Britain. Beginning the book, I was very excited for my imagination was going wild – from silently warning Lenny to not be a fool and follow Jessica to thinking how evil Ezkiel would be… I thought of several scenarios. Plot wise, I liked the first half of the book much more than the second half. The first half had that anticipation building up, it had a thrilling factors and it made you race… the second half, however, fell a little flat as compared to the first one. However, it does get better by the end with more twists building up… leaving you longing for what happens next. I liked how the characters are in the book. Considering it an erotica, you would expect the picture-perfect characters working through their pursuits… however, it’s not so and it’s something I admired. There’s something relatable about the characters that have their insecurities and demons. Afterall, we all love a good villain in a story along with the hero. Don’t we? However, there’s this one line that bothers me – ‘were sweets to a fat kid…’ as if fat kids are supposed to be desperate… as if because they have ‘always been unwanted’ they’ll find imperfections perfect… but then again, shouldn’t everybody find accept imperfections anyway? Otherwise, I liked how Jessica and Lenny aren’t the most attractive characters out there, in terms of their physical appearance. Sadly but happily, I can’t say Jessica is attractive otherwise as well… she’s mean. Really mean. And you hate her. Lenny has a sad past making me sympathise with him a little bit, but not so much. Ezkiel… well, I would have liked more of him in the book… to know what’s going on in this Daemon’s mind, really. As for writing, I think it’s smooth and flowy. It’s fast enough to help you race through the book for an entertaining weekend read. I liked reading it, very much. Overall, I think if you’re looking for a quick fantasy erotica to read for a weekend, Ouija Board could be an enjoyable pick.